Back to the archive main page. Special Thanks to ReFrame Peterborough and The Ontario Arts Council for their support. 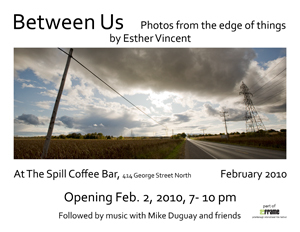 Peterborough, Ontario, Jan 25, 2010 — In association with ReFrame Film Festival, the Spill Coffee Bar will be hosting an exhibit of photographs by Esther Vincent for the month of February. The exhibition is an offshoot of a project in which Vincent was asked to take photographs of weather and how it affects the way we feel as we move through the day. When she was driving through the rural landscape around Peterborough, Vincent was struck by the traces of humanity that appear in the vistas - roadways, buildings, the geometric lines of ploughed fields. In her photographs, Vincent attempts to show a place where people live within nature. To Vincent human beings are part of nature. We are part of nature and it is part of us even when we try to separate ourselves with walls, black tar and car doors. Whether threatened by a storm or lit by a soft sunset, in the striking landscapes displayed in “Between Us” people and animals are surrounded by and integrated into the land and the sky. The exhibition runs from January 25th to February 28th. The opening is Tuesday, February 2nd from 7 to 10 pm followed by music with Mike Duguay and other local performers. The Spill is located at 414 George Street North. Bio: Esther Vincent first learned about photography as a young girl curious about her father's darkroom. Her photographs have been published in several magazines, most recently in Peterborough’s new arts and culture magazine, Pearl and The Dance Current, Canada’s national dance magazine.